First off I am so excited!! 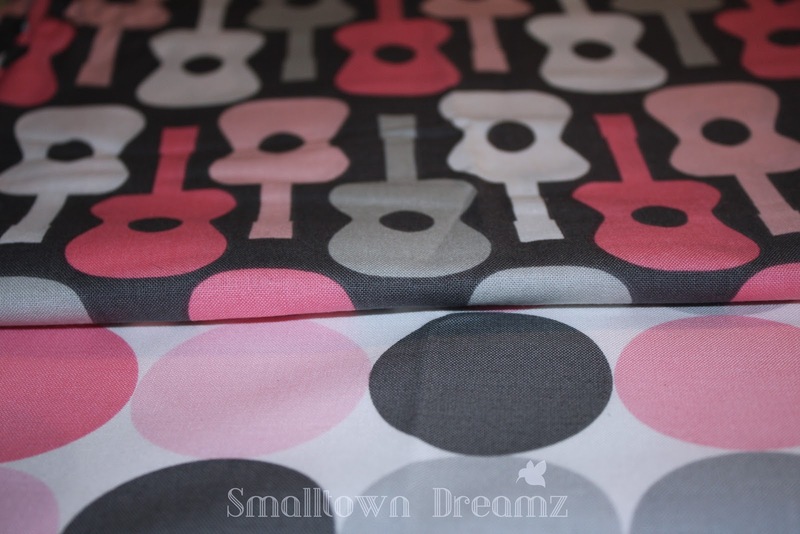 My Michael Miller Groovy Guitar and Disco Dot Fabric has arrived. This is my first real "designer fabric" that I get to work with. I bought it off a site called Yardseller. I have to say the site is pretty cool and you can get some amazing deals on there for fabric and yarn. 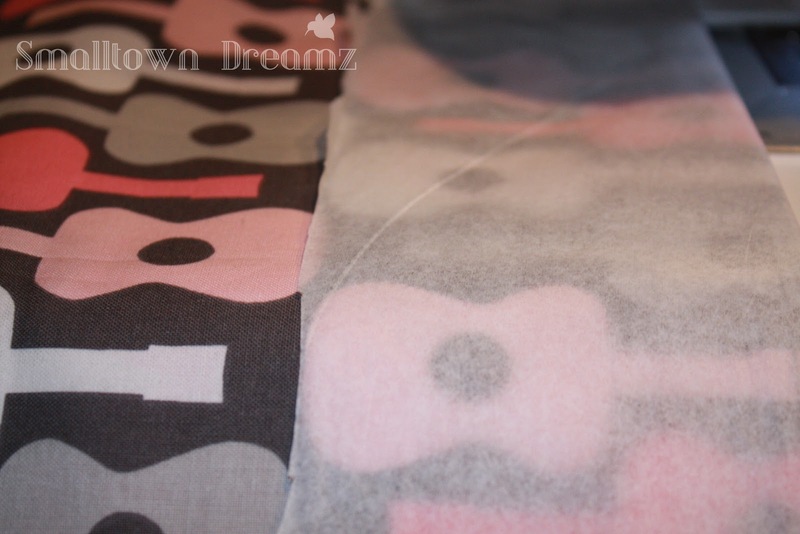 The day I bought the fabric I knew right away what I wanted to do with it. I have been dying to make a great little beach bag for myself. I just loved this fabric and thought it would be perfect for what I wanted to do with it. After it arrived I just sat there sort of intimidated by it. I only had a half yard of each so I knew I didn't have much room at all for error. Knowing myself... this was going to be a challenge since I still have not mastered the art of being able to measure and cut everything to be exact just yet. 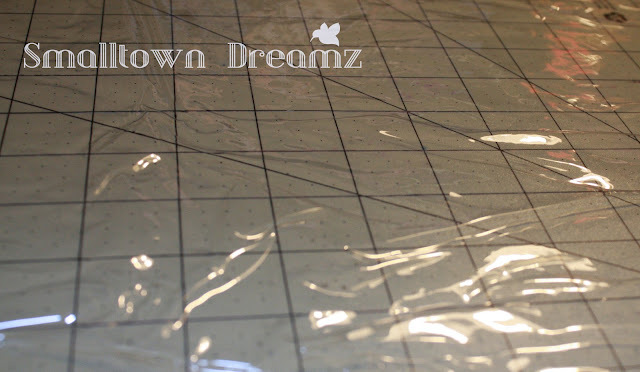 However as I sat there and pondered exactly how I wanted it to look it dawned on me that I had a few yards of that clear heavy plastic in my stash that I got on clearance from our local Wal-mart. Then just like that I was picturing an amazing bag in my head. Now silly inexperienced me didn't realize that this plastic is not the easiest to work with. However before I even was able to go down that road I desperately needed to get all the tiny wrinkles out of this plastic. 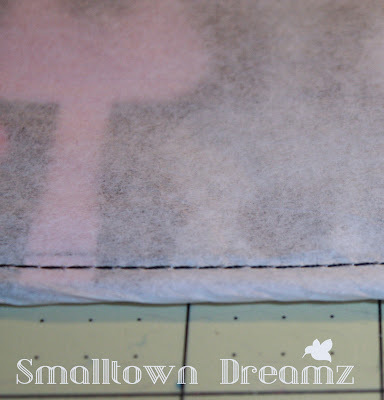 I called a couple people that I knew that sewed as a hobby and none of them had ever worked with this material and told me there was not much I could do other than to lay it flat and maybe lay some books on it over night to flatten it out. Well I knew there had to be a better way so I got out the iron. Yes I said the iron. I have to be honest I really didn't learn to use an iron until I started sewing. 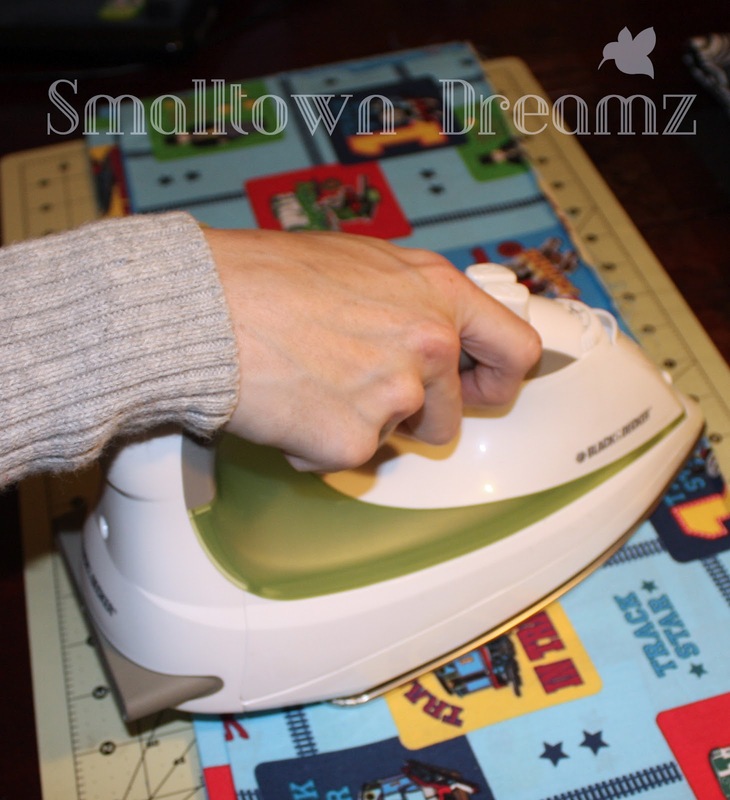 So anyway I turned the iron on 4 which on ours is a low to medium heat. 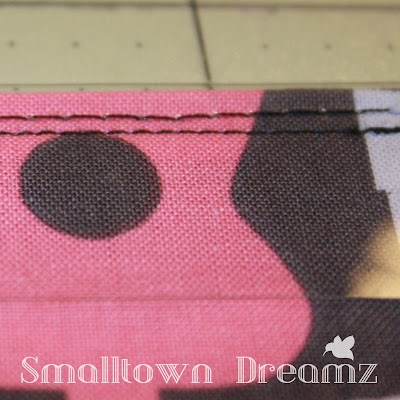 I laid my plastic on top of my layer of fabric then laid 2 more fat quarters folded in half over that. (So I guess you could say I laid down 4 layers of fabric over the plastic.) I pressed firmly but didn't sit over one spot for very long. During the Ironing process I learned the best this work properly is to get every inch, then flip it over and do it again on the other side, then flip it over and do it on the other side one more time. 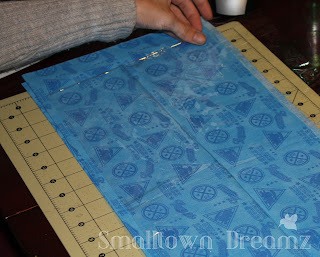 After that I laid it on my cutting mat and used my fingers to press it flat and get all the bubbles out. When you do this you will feel that it is still warm to the touch. Stretch it out and lay it as flat as possible. Let it sit for about 5-10 min and let it cool off. You will notice it gains it firmness back very nicely and it’s FLAT!!!! I was so happy this worked and didn't ruin the iron. My Husband uses the iron a lot to iron his chef jackets and stuff so I was a little worried that I was going to ruin it during my little experiment. Here is the before and after of the plastic from the ironing. Some of you might say why don't you just look it up on the Internet. Well I am one of those people that like to do things on my own and experiment with everything. Then if all else fails then I hit the computer and start looking of tips and tricks. Now I was in my groove. That was until I went to go sew my plastic to my fabric. I dropped my foot, lengthened my stitch a bit so I wouldn't perforate the plastic, started sewing, and it just sat there. I couldn't get it to move. I panicked for a bit. I knew I didn't have enough expertise to understand why when I sew with fabric it just glides through like butter and this I couldn't get to move at all. I dropped my teeth and still nothing. So I sat there and I must have had a look of defeat because my Husband walked over asking what the problem was. As I am explaining to him what is going on he is looking over all my steps to make sure I wasn't missing something. (For those that don't know my Husband was the one that taught me how to sew and I will be forever grateful that he did.) We sat there for couple minutes trying to think of something that would work, when out of know where he says use tissue paper. I know some of you might be going DUH! At the time I honestly didn't know whether it would work or not but I am always willing to try new things. So we pulled out some tissue paper, some scrap material similar to what I was working with, and a scrap piece of my plastic. I lined everything up how I would be for my main project. Then I wrapped the tissue paper around the front and back of where I would be placing my stitches, lined it up, dropped my foot and started sewing. Just like that it went through the machine like butter. I was just thrilled. I stood up gave my husband a big hug, thanked him, and got back to work. 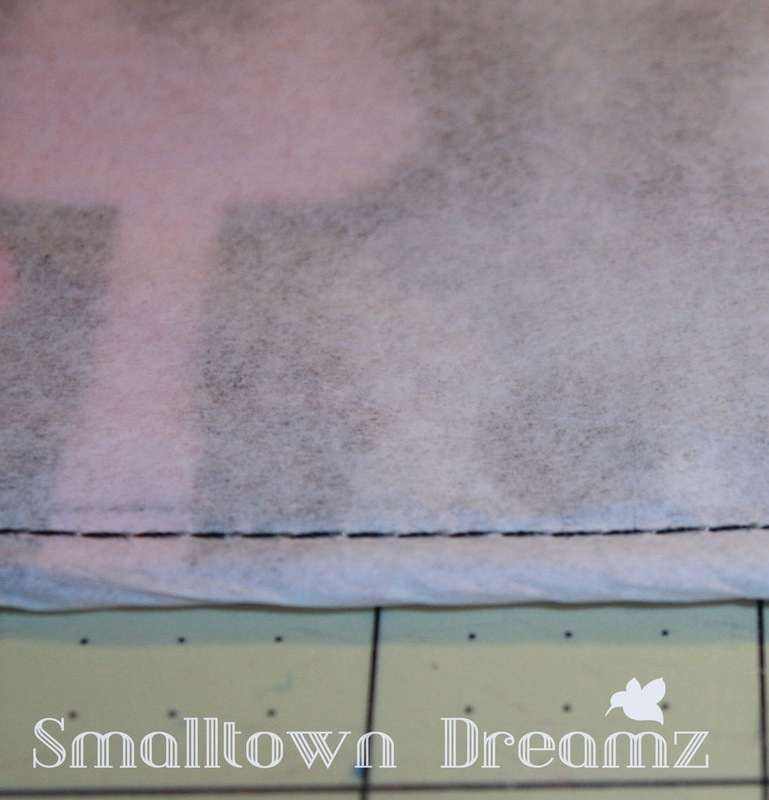 After you are done sewing you can then just tear off the paper and it cleans up really nice. Now that I know how to use this material I think you will start seeing it in more of my projects. I think you can do a lot with it. I wanted to give this tutorial for those that have never worked with it because I think this is an easy and great way to get clean and precise lines with this hard to work with material. I will show you the bag as soon as I am finished along with the rest of the tutorial. I am hoping to get it done by Friday for you. Also on Friday I will be showing the final photos of the Pink Pennant Banner. I am getting the photos back from the photographer tomorrow and I am more than thrilled to see how it turned out for her photo shoot. I am still undecided whether or not I am going to put the banner up for sale in my shop or not. I am so proud of it; part of me wants to keep it. Also just a reminder to those who like to crochet. I have a Crochet-A-Long that started this week and there is still plenty of time to get involved. Check it out it will be a lot of fun and will give you a chance to meet new yarn lovers. The pattern is a Tetris Themed pattern that was designed by me. 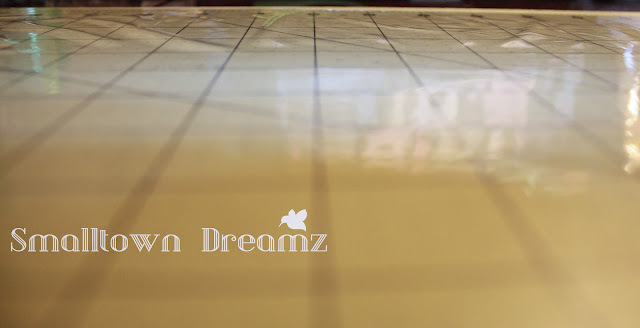 Sign-up is on the Smalltown Dreamz Facebook Fan Page. Click on the Events Section. As always I love to hear from my readers. Have you ever worked with this type of plastic? What have been your experiences? 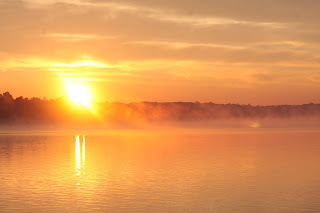 I just stumbled upon your blog, so thought I would take a moment to comment. So glad I found you! You are so very talented! I have used the plastic you mention, and my daughter has to. We recently used it to put together some travel jewelry cases. Thank you Becky! I think that is a neat idea for making travel jewelry cases. I have a few family members that travel a bit and I know they would use something like that. yeah the tissue paper works out really nicely. Good luck let me know how it goes.